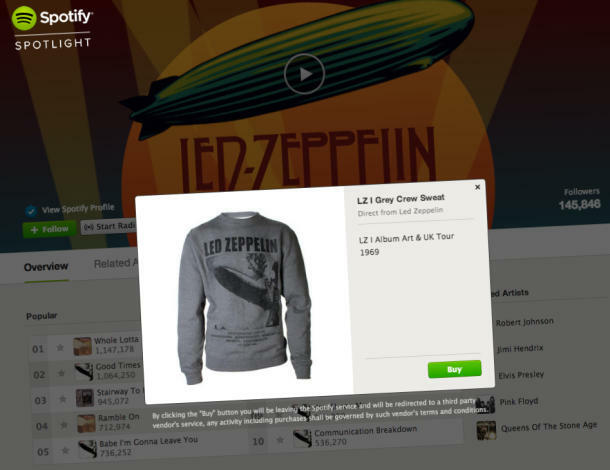 Spotify adds in-app merch stand to artist profiles | Music – CNET News. Ask us how you can get started using this service and how we can manage it for you. Been there, streamed that, bought the T-shirt… you can now buy shirts, records, and other merchandise from your favorite artists through music-streaming service Spotify. Clicking on an item shows you a preview image and then takes you to the band’s online store, wherever that may be. Merchandise is available to buy if you’re listening to Spotify in the US, UK, Ireland, Australia, New Zealand, Denmark, Sweden, Norway, and Iceland. Any band or artist can add a merch stand to their profile within the Spotify app. They can only offer three items at a time, but on the plus side there are no fees: neither Spotify nor Topspin — which provides sales and marketing software to artists — take a cut when a fan drops some cash on a new shirt, poster, or album. Topspin has a similar deal to offer merchandise through forthcoming rival streaming serviceBeats Music, which is set to launch on Tuesday.